The Regional Center for Social Science and Sustainable Development<http://rcsd.soc.cmu.ac.th/home/> and the Mekong Land Research Forum<http://www.mekonglandforum.org/> will run a week-long intensive summer school on land research in the Mekong Region. Applications are welcome from early-career academics, government staff and those working with civil society organizations. 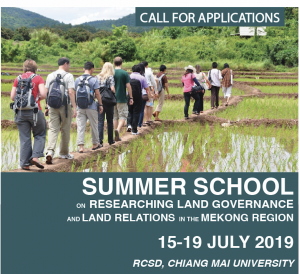 The purpose of the summer school is to equip participants with a research orientation relevant to the challenges of land governance in the Mekong Region. A good working knowledge of the English language is required. SCHOLARSHIPS are available for participants from Cambodia, Laos, Myanmar and Vietnam, covering travel and accommodation support. Participants from elsewhere (including Thailand and China) will need to fund their own travel and accommodation costs, but all tuition and meal costs will be provided without charge.